The mineral-collecting community has become acquainted with the Flambeau mine, a copper mine in Ladysmith, Wisconsin, through the crystallized mineral specimens (especially chalcocite) that have appeared from that locality over the past 3 years. 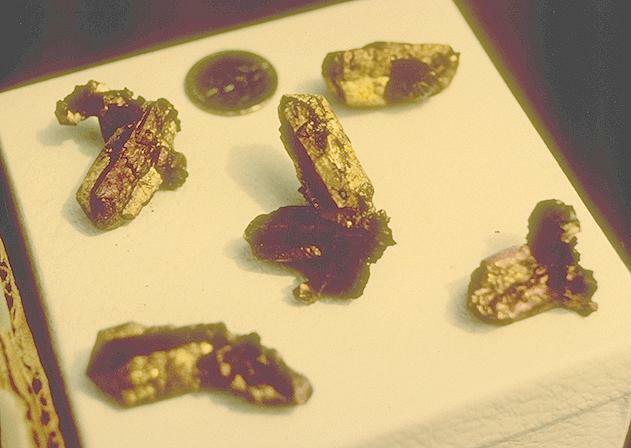 The fact that these rare and beautiful specimens were preserved during the process of ore-mineral extraction is due to decisions made by management at the Flambeau mine, and supported by commitments from its parent companies, Kennecott Minerals Company and Rio Tinto (RT, formerly RTZ). So we hope you enjoy the images presented here, and check back once in awhile to see some new ones. In 1994 when news first began to leak out that chalcocite crystals of some substance were being found at a small mine in rural Wisconsin there was some skepticism. Few link Wisconsin with either mining or significant mineral specimens (with notable exceptions). In reality early Native Americans mined lead ore and the first permanent non-native settlers were lead and zinc miners. The Wisconsin State Seal displays a miner and his tools, a badger and a stack of pig lead. Also called "the Badger State", the badger was a symbol of lead miners who lived in abandoned mines and burrows in hillsides. Its role as the nation's major producer of lead helped the early territorial government attain statehood. This all being said, except for a number of knowing exploration geologists, most were surprised when Kennecott Minerals began the permitting process for an open-pit copper mine in Rusk County, Wisconsin. During its short four year run, the Flambeau mine not only produced high-grade copper along with gold and silver, it also produced uniquely-patined chalcocite crystals. The history of the Flambeau orebody discovery and subsequent mining project is nearly as colorful as some of the minerals recovered from the open pit. Early in 1915 George W.O. Hotchkiss, working for the Wisconsin Geological and Natural History Survey, was prospecting and mapping much of north central Wisconsin. His notes and some rock samples were eventually stored at the offices of the Wisconsin Geological Survey in Madison, Wisconsin. Many years elapsed between this early work and Kennecott’s initial interest in the Lake Superior region starting in the 1950's. This interest was based in part on the supposition that the Canadian Precambrian Shield, which to the north in Manitoba and Ontario contains many massive sulfide deposits, that such mineralization should continue south in Minnesota, Michigan and Wisconsin. In 1954 George Moerlien began prospecting in Wisconsin and Michigan for Kennecott’s wholly owned subsidiary Bear Creek Mining. While in Madison, that same year, Moerlien was shown Hotchkiss’s rock specimens and information. One specimen was particularly exciting in that it assayed 0.7% copper. The report by Hotchkiss on this specimen stated that it came from a well dug near the old school house, south of Ladysmith. Moerlien traveled to the school house and searched the area, but while no outcrop was visible, azurite and malachite fragments from the old well were found. It was decided that since airborne electromagnetic (AEM) surveys were being flown over parts of Minnesota and Wisconsin that some smaller targets should also be flown. The school house prospect was selected as one of these. No anomalies were detected, however, enthusiasm continued for the possibility of deep massive sulfide mineralization. W.F. 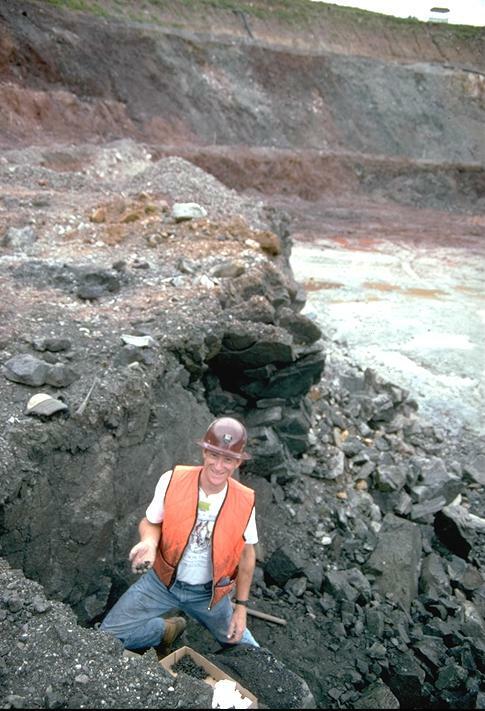 Read and Russell C. Babcock of Lawrence University continued geological mapping through the late 1950's, generating data from which the next stages of exploration were based. The period between 1960 and 1965 was a quite one since Kennecott went west looking for copper porphyry deposits. Kennecott reentered Wisconsin in the mid-1960's, at about the same time Carl E. Dutton of the United States Geological Survey began conducting a library research program where by all the notes, rock and mineral specimens collected since 1915 were reexamined and compiled. Dutton with Reta Bradly eventually organized all this early data into a comprehensive geological map of Wisconsin, which was published in 1970. Great Lakes Exploration, a wholly owned Kennecott subsidiary, with Jack Phillips as exploration geologist, reentered Wisconsin in 1965 to continue the massive sulfide program due in part to an increase in depth penetration of the AEM system. Jack Phillips spotted the same sample Moerlien had seen which was now sitting on Dutton’s desk. Based on this sample plus other weakly mineralized outcrops found in western Rusk County and reviewing the extensive data generated by Read and Babcock in the 1950's, Phillips convinced Great Lakes Exploration to fly a large area of the county. This area included the school house in the southeast corner, the Flambeau river on the east side, and the Blue Hills located in the northwest corner. 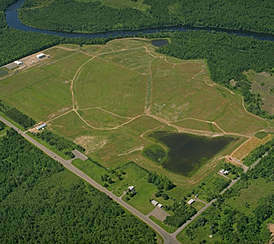 E.H. Eisenbrey supervised the AEM program that resulted in a strong anomaly on the eastern most line on the east bank of the Flambeau River, just south of Ladysmith. Amazingly had the eastern line been flown one line to the west, the Flambeau deposit would not have been discovered. In 1967 Eisenbrey authorized two additional short lines to be flown from the river east to highway 27, a distance of 1 mile. These lines eventually resulted in the drill discovery of the Flambeau deposit. In the spring of 1968, an extensive exploratory core drilling program began in Rusk County and on November 6th of that year the Flambeau deposit was discovered. Core pulled from that hole showed 48 feet of massive supergene enriched chalcocite that averaged 9.25% Cu. Drilling to define the deposit, along with environmental studies and public hearings continued through 1976. From 1977 to 1985 the project remained dormant. In 1986 Kennecott reopened the Flambeau project since copper metal price forecasts were optimistic. 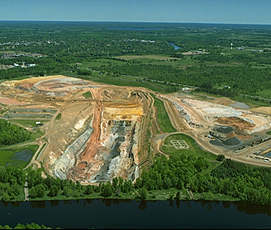 Progress towards actual construction and mining involved numerous public hearings, reviews, and permit applications from 1987 to 1991. Ultimately due to the dedication and commitment of the Flambeau Mining Co., a wholly owned subsidiary of Kennecott Minerals, permits were granted in June 1991. 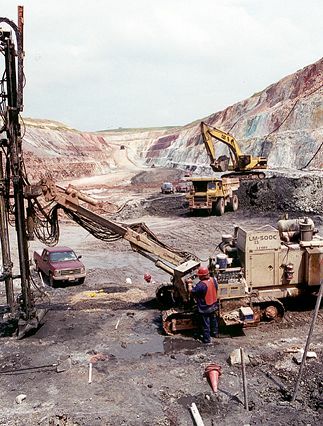 Ground was broken on Wisconsin’s first sulfide metal mine to operate under Wisconsin’s new mining laws in 1992 and on June 28, 1993, the first crushed copper ore was shipped via rail out of state for processing. Since 1993 the mine has successfully operated without any violations, citations or complaints to the present day. This is a truly outstanding accomplishment since the mine is within 140 feet of the Flambeau River, 500 feet of Highway 27, within 1000 feet of private residences and 2500 feet of a liberal arts college, Rusk County hospital and nursing home. The collecting history like so many operating mines in the past really begins with the geologists on site or the miner picking up a pretty rock. In the case of the Flambeau it was a lot one and a little of the other. The visitors center needed specimens from the mine to put on display for the interested public so mine geologists collected specimens of azurite, malachite, native copper and chalcocite. It was these very specimens that encouraged the authors to seek a recovery contract with the Flambeau Mining Company. The first day collecting at the Flambeau was very much different than the underground environment that had so much been a part of our collecting experience. We went to work immediately at an area where the ore body contacts the quartz- sericite schist or siliceous chert. We were quickly rewarded with a few reniform to sub-euhedral crystallized chalcocite specimens. All of these first few pieces were of the typical black to steely-gray color so characteristic of chalcocite. Two days of sporadic finds of this kind of material while exciting were just wetting our appetite. We really felt that with the kind of specimens that we had up to this point found and the specimens we had seen at the visitors center and in the administrative offices that the good ones were just a few more inches from our last pick hammer blow. On June 30th 1994 our intuition was proved right. A small pocket, beneath a ledge formed when a large block of chalcocite ore was removed, contained 5 chalcocites that rivaled anything we could have realistically imagined. Having personally handled thousands of specimens over many years, never had I held such a spectacular specimen, let alone a chalcocite. This led us to immediately name this void the First Pocket (401.2 - 1030 level) . Thankfully this pocket led us directly to, and on the same day, to the watercourse pocket, which was a few inches into the face of the work area where the First Pocket was. The Watercourse pocket as the name implies had water running in it, the chalcocites from this void all had a gold patina which after time turn violet-purple. The crystallization was not quite up to the level of the crystals of the first pocket, but confidence reined supreme. The next pocket to be discovered was the Sunrise Pocket. It was a long interval between this discovery and the past success earlier in July. To have some muck cleared from this area we needed Joe the excavator operator. So as not to impede production he could on his way to his mucking spot take a couple of cleanup swipes at our promising area. Of course starting time is as soon as there is just enough light to see. Joe expertly maneuvered the shovel of the excavator to get as much of the muck away from the corner that looked the most promising. Still I was left with the need to hand muck approximately three or four yards of sulfide ore.
Just as the sun was peeking over the rim of the pit, the outline of an in situ pocket was revealing its self. in a corner formed by the 1010 level bench and the footwall bench. Slowly brushing away the loose damp bornite sand started revealing gleaming bright metallic golden crystals. They were packed in with just enough space between specimens to facilitate one by one removal. Laying on my stomach I slowly worked the pieces out using the sand as a cushion for the chalcocites when needed. Small broken shards of quartz-sericite schist and small chalcopyrite casts after calcite, that looked like hundreds of tiny ice-cream cones made up the pocket debris. The chalcocites that came from this pocket were unusual in that they had bornite after chalcocites associated with them. Also the sizes of the crystals were almost unbelievable. One crystal group the "Flambeau Chief", with most prominent crystal coming in at almost 4cm across. survived unscathed. We still to this day dream of what this void could have yielded if it had been carefully collected. "stopsign" crystals of golden-violet chalcocite scattered atop the broken muck. The two dozen or so of these specimens were thumbnails, and quickly wrapped. edges and delicate habit of these crystals were never found again. Next comes the Lucky Friday Pocket, naming this one was easy, Friday, October 13th. This one was a bitter sweet experience. By this time we were living full time in Ladysmith and onsite every day watching every load of ore and waste rock that Joe lifted out of the broken and shattered blast pile . Along with checking almost all the drill holes that were drilled by drill tech Randy Ralston and crew. On this day there was guarded optimism. The day before while the drilling the blast pattern for this shot, one hole encountered a good sized void at 7.5 feet. This hole was left unloaded of explosives and as many burlap bags we could stuff down the hole was placed. Credit here must be made to the blasting crew for their expertise and in particular to Ames Construction project manager Bob Donalson for the creative basting techniques used to help minimize destruction of specimens and yet "pull the round". Late in the day after the shot on the 12th ,scouting this blasted zone broken loose crystals were recovered. We had Joe position the excavator, and he directed the haul trucks in such a way as to be able to dig perpendicular to the strike of the ore body, taking small slices from the area were we expected to find the burlap bags. Late in the afternoon with heavy clouds threatening snow, the bucket swept past where the hanging wall contact was exposed, and big crystals started sliding out and down the soft pocket muck. The feeling was one of elation yet concern that nothing would survive . No burlap was yet visible. There was 10 feet of heavy broken ore on top of this exposure. Joe expertly worked the cap off the area and the burlap bags became visible, muck was removed down to the last bag . With just an hour of light left expedient removal of the best specimens was of the utmost concern. Incredibly many specimens survived the harsh treatment of blasting, mucking, and rushed recovery. Once again the nature of these chalcocites was completely different from any we had seen. The crystals ranged from thick disc-like sub parallel stacking to rarer heavy thick penetration orthorhombic x-twins and the classic perfect "stopsign" sixling twins. Predominate color was golden, darkening to brass, violet, purple, blue and gray, depending on the angle of light and viewing. There were a very few specimens that had a non-iridescent coating of matte blue bornite. The Quick Pocket needs a mention because the location of the pocket was unusual. was taking place just above the pocket area necessitated the more than usual constant monitoring of loose ground. 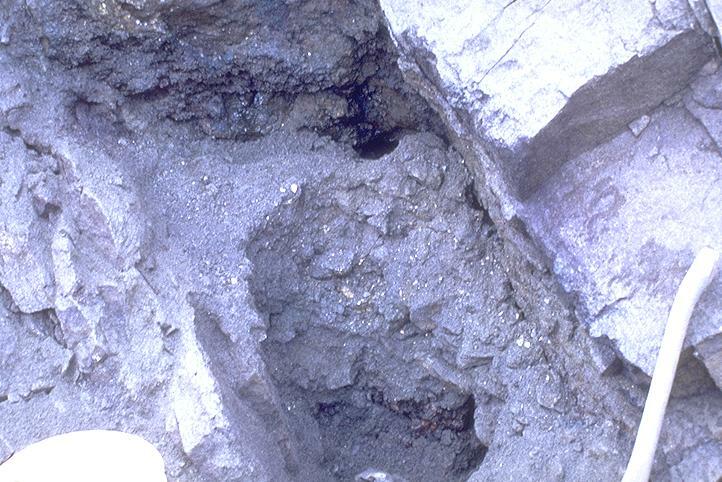 The drilled pattern was to be shot regardless of mineral specimen concerns, the main ramp into the pit was at stake. So quick recovery methods were used. Quick Pocket. The chalcocites from here are less well developed and are tending to be replaced by bornite. Crystals ranged up to 6cm. The Rocket Pocket. Located at 401.3 - 970 level. This was to be the last significant pocket encountered. It did not come quickly rather it was drawn out over almost a weeks time. Beginning with the start of drilling the pre- split holes on the 970 level at 401.3, on the far west end of the pit. These holes were drilled for the step outs which were planned every 30 feet or three levels. Consequently these holes were drilled to a depth of 30 feet, every three feet, versus the normal blast hole of ten feet. when the first hole closest to the hanging wall contact zone collapsed and the drill steel became hopelessly stuck. One new hole was begun near this bad hole and at a depth of about 2 feet the drill steel dropped through 4 feet of void before biting into hard ground again. When steel dropped our hopes soared! The decision was made to pull out of this hole before the steel became stuck as the condition of this hole was rapidly deteriating. After pulling the steel from this hole it was evident that it would not be able to be used to set explosives, a 3 foot section of 2 inch PVC pipe was pounded in as far as it could go into the broken and collapsing hole. The next hole to the north was barely competent enough to load. The rest of the holes to the north held up well and were not a problem. To drill the presplits had taken Friday, Monday, and Tuesday. That was one long weekend. The regular blast pattern was drilled out and loaded along with the presplit holes with explosives on Wednesday. The blast countdown commenced late in the day on Wednesday. Just as the words "fire in the hole" finished leaving Bobs mouth, the ground erupted in the familiar staccato of timed charges going off. The PVC pipe had become airborne, shooting almost straight up trailing smoke and dust . There was an easy name for a pocket. Onsite and ready to go at first light, tools at the ready, this had to be a good one. One, a void was there, two, it was up against hard face, and three we were due. Again Joe set up to mine away the hanging wall contact area in the most productive and merciful (to the specimens) way. 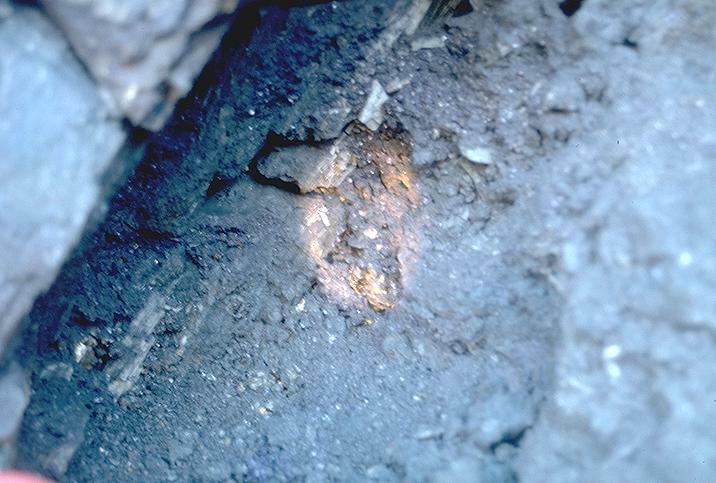 At about 10:00AM the outline of a large cavity was quickly being exposed at the hard face of the far west end of the pit, right under where the pipe had taken flight. Recovery began as soon as the excavators bucket was out of reach of possible contact with body parts. The pocket was full of blast rock so crystals were not easily seen. Careful probing and removal of this waste material began to show more and more specimens. The crystals once again decide that they would be completely different than all the other chalcocites so far observed. We believe that as much as 20% of this pocket was completely destroyed by the blast. Among what remained were the largest specimens recovered to date, four at over 20lbs, with up to 90% crystal coverage. Habits included sharp single orthorhombic crystals, single sixling twins, stacked sixling twins and unusual feather like crystals. All the specimens have the distinctive multi-colored iridescent sheen. It took a total of 16 hours to remove all specimen material from this pocket. The void was big enough to sit in with room to spare, aprox. 3' wide by 4" high by 3.5' deep. 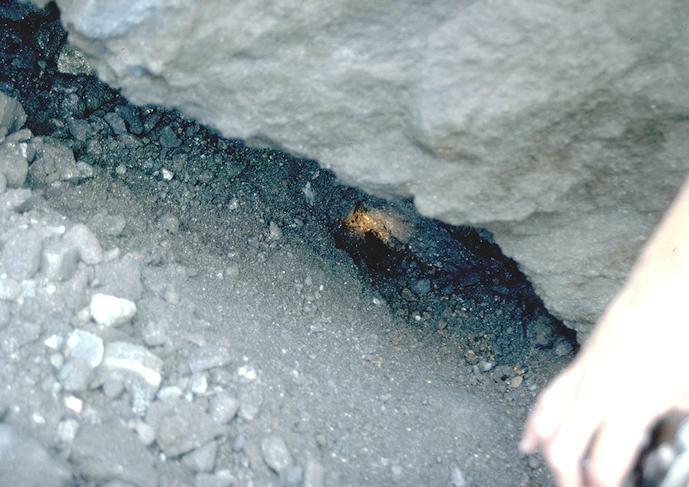 This was to be the last pocket to be encountered at the Flambeau mine. Top two photographs by T-BO Studios, all others by the authors.